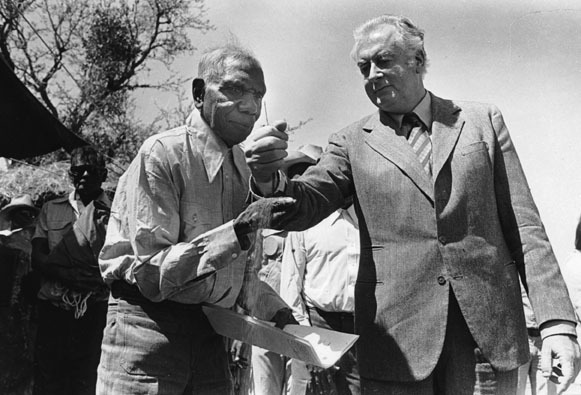 Today, 16th August, marks the 35th anniversary of the day Prime Minister Gough Whitlam poured a handful of sand through the fingers of Gurindji man Vincent Lingiari, to symbolise the restoration of land ownership to the Gurindji people. Source: National Library of Australia. The story began on Wave Hill station, a large cattle station about 600 km south of Darwin in the Northern Territory. For many years after European settlement it was run by the British pastoral company called Vesteys. Vesteys employed the local Indigenous people, the Gurindji, to work on Wave Hill, but working conditions were very poor and the Gurindji people were paid much less than the other workers. In 1966, Vincent Lingiari, a prominent Gurindji man who worked at Wave Hill, led a walk off of Indigenous workers as a protest against the poor pay and conditions. The protesters established the Wattie Creek Camp and demanded the return of some of their traditional lands. Vincent Lingiari travelled all over Australia to address meetings and raise support for the strike. The protest eventually led to the Commonwealth Land Rights Act of 1976 which gave Indigenous Australians freehold title to traditional lands in the Northern Territory and powers to make decisions about mining and development on those lands. An act of patience and bravery well worth remembering. I do have a dog. He is rusty brown and his name is Arthur. And he is a good companion on our late night walks together. My rusty brown dog is reliable and friendly. He listens in to me, seemingly without his own agenda in mind, and he is easy to please. One thing about dogs is how content they are. They make a big deal about small things – a stick, a biscuit, a trace of a smell they sense in a prickly bush. They don’t worry about what other dogs think of their body shape – they don’t mind being fat or skinny or not having curves in the right places. They don’t watch television, they don’t ask for lollies. They don’t gossip about other dogs and they don’t have hip clothes. They don’t check the price of their shares, plan for retirement, or search for friends on facebook. They are glad to see us when we get home. I read a book once which listed all these things we could learn from dogs, like being loyal and never pretending to be something you’re not, like not passing up the chance to go for a joy ride, and that when someone’s having a bad day you should just sit quietly by, and nuzzle them gently. I was also reading another book about dogs and humans, and how we ended up forming such an alliance. Who needed who first? It may well have been that the dog-human relationship was based on mutual survival. In early human times, we needed each other. They needed us for protection. We needed them to help us hunt. And having some closer affiliation with another member of the animal kingdom was comforting, and the alliance with the dog became relational as well as practical. In a more modern world, maybe we still need each other just as much, but for survival in a different way. From where I sit, much of the modern world endures what some call a ‘social recession’ – broken relationships, outrageous consumption, financial stress, greed, depression, fear of strangers. A fascination with wealth and continual gathering of possessions is a central part of our culture, and it makes me terribly uneasy. The uneasiness is compounded by the knowledge of a world in which so many people suffer from not having enough of the basics for survival – food, water, shelter and medicines. It is an uneasiness that surfaces at children’s birthday parties, on reluctant trips to suburban shopping complexes and not surprisingly, emerges a lot at Christmas. There is a nagging inside that searches for a simpler but better life that might have been lost somewhere and a wariness of an overriding greed that is seldom recognised. I suspect that not only is too much consumption unfair, it erodes many of the good things about human life and living in community. In a way, we all miss out. The apparent contentedness of the dog reminds me of that inner struggle, and how it might be different. Can we take a dog for a walk and learn from his contentment – he smells the air and plants. He wags his tale and gives a doggy smile to his family, and then he does the same for strangers too. When he comes home and sleeps, he needs no hi-tech entertainment or alcohol, just some companions and a home. And rusty brown? Brown does not belong only to my dog Arthur. Brown is the colour of long dusty roads, the earth, of skin, and brown paper bags. It is the colour of rust, of chocolate and bread and brewed tea, of old bottles and tree trunks, of worn out and old things. And it’s the colour of recycling and nature. It is a good companion for green in the symbolism of sustainability. 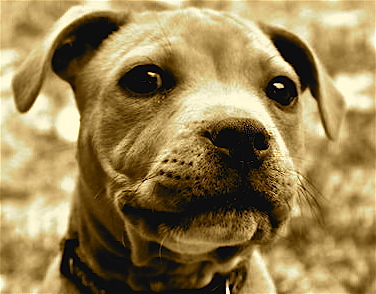 We are different species’, but the simplicity of my rusty brown dog reminds me of what life could be. The people I know who aim to live as simply as they can – to use less resources, to focus more on relationships and justice and compassion than on material acquisition, contribute more to a saner world than they could ever imagine. Often they have more time to be with neighbours and families, and to help out at local schools and community projects. They use less resources and create less waste. And they give things away – money and time, to projects that alleviate poverty close by and far away. Often they seem more satisfied too, more content, more aware, even as they live honestly with the limitations of their own actions and the knowledge of a world in strife. It makes sense really, that simple living has a lot to offer our current times. Our world is faced by an environmental crisis requiring massive change to the way we consume resources, and poverty and inequality are a persistent reality. If we are critical enough, most modern western societies are diminished by genuine concerns about health, well-being and community. That social recession just won’t go away. The actions circling around simple living bring some genuine alternatives on a number of fronts – less resource use, generous sharing, more time and intent for rebuilding often fragmented neighbourhoods. No doubt these actions and attitudes also involve struggles and dilemmas, and it seems, an amount of courage. It sounds like a movement suited to our times. My rusty brown dog reminds me of these ideas and actions and hopes. Perhaps they are just what we need, not only for survival, but for a life worth living.